This scientific paper was inspired by the Quito Dialogue Seminars in 2012 and 2014. “Innovative financial mechanisms” for biodiversity conservation involve economic and other policy instruments like taxes, payments and markets for ecosystem services. 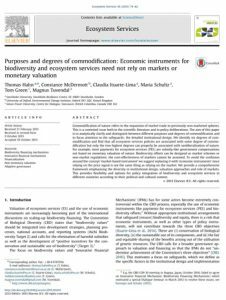 Some of these instruments are controversial in the CBD community and the paper distinguishes six degrees of commodification of ecosystem services. We conclude that low degrees of commodification, like taxes, payments and compensation schemes, can have positive effects on the CBD objectives, given appropriate institutional design and safeguards. Higher levels of commodification, where quantities and prices result from market negotiations, require a rigorous institutional framework to deliver to the CBD objectives and then the low transaction costs which were desired would not be achieved. Hence, the dichotomy market vs. state is not appropriate for biodiversity and equity objectives because these are largely public goods, with well-known limitations for markets to deliver.